The .45 ACP is renowned for both its heritage and overwhelming effectiveness. 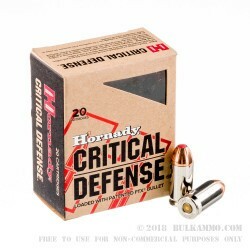 With the introduction of the Hornady Critical Defense 185 grain .45 ACP Jacketed Hollow Point ammo, Hornady once again aims to improve upon this perfection, and does so mastfully. 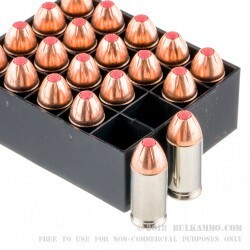 Using Hornady’s patented Flex Tip bullet technology, Hornady Critical Defense 185 gr .45 ACP JHP rounds will not clog when passing through thick fibers such as denim and nylon taffeta, and are instrumental in ensuring a clean, well timed expansion regardless of having to pass through immediately obstacles. 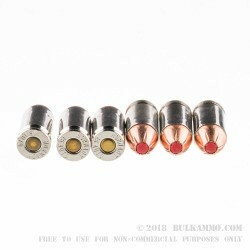 Bright nickel plated brass cartridges are water repellent and corrosion resistant, and are highly visible during low visibility press checks to ensure your firearm is in condition one statues are ready to go as soon as you are. 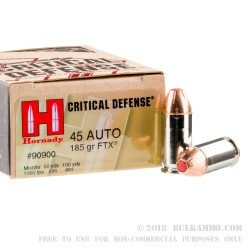 As one of the most affordable and dependable self defense rounds anywhere in the industry today, the Hornady Critical Defense 185gr .45 ACP JHP is as lethal as it is reliable.